Mars is not going to have a population in the billions. Achieving very high productivity and supertechnology in a small community is far more doable. Plus, if technology was such a great multiplier, we'd apply it here on Terra and get those benefits. After which we'd terraform Mars for a lark, because that's what powerful post-scarcity societies do to stave off boredom. No it won't have a population in the billions and that is a big part of the problem. It won't have economy of scale in any industries. It will need to either make a huge variety of products at very small scale, which is inefficient, or make a few at large scale with enough profit to overcome the huge import costs of the rest of what it needs to import. Some compromise will no doubt be reached. If there is something very valuable it could mine or make that cannot (or cannot easily) be produced on Earth, then perhaps making almost everything will be unnecessary. The only thing I can imagine in that category are manufactures and raw materials destined for Earth orbit. Since Mars has only a tenth the Earth's mass, it is not inconceivable that it would be cheaper to make an item on Mars and ship it to Earth orbit than to launch it from Earth. Even so, I think the sheer complication of that sort of triangle trade makes it a long shot. 1. The Mars colony will not have superior technology to an Earth based nation. Its technology sets will be about the same. Its research capabilities will lag those of any Earth nation until it achieves comparable population. Why would we expect superior technology? It is not a question of superior technology per se. We need to compare the amount of hi tech (industrial robots, domestic robots, transport robots, automated machinery, 3D printers etc) being used on a per capita basis. I am suggesting the Mars community will have much more access to hi-tech capability on a per capita basis. Remember planet Earth doesn't just include the residents of Silicon Valley. It still includes billions who have virtually no access to hi-tech capability. 2. Capital is basically the stock of factories, machines and other infrastructure available to support mining, manufacturing, services, transportation, etc. These things have to be made or imported. The US and other nations, didn't just materialize these things over night. Capital investment in developed nations is an iterative process, with new investments building on older ones. The high incomes of the developed world are the result of centuries of accumulated capital. A Mars colony will not only need to start from scratch, but must import capital infrastructure at enormous cost. My vision of the Mars economy is that they have the initial endowment of what is in effect a small scale industrial infrastructure. So, for instance, within a short time they will be able to manufacture PV panels, silicon chips, circuit boards, electric vehicles, propellant tanks, and even smallish rockets. You are right of course that the US and other nations didn't just reach that point overnight. But now all the knowledge to do these things can be made easily available in digital form, 3D printers can manufacture a huge variety of parts and products, and robots can be programmed to undertake the skilled tasks that humans perform on Earth. As I suggested in my post, it doesn't make a great deal of sense to compare "income" between Mars and Earth. Initially you could say the Mars pioneers are "poor" - they won't have a car, or a house, or go to rock concerts, or take holidays or buy magazines and books or purchase a range of clothes and shoes each year. However, that doesn't mean they won't be super-productive. 3. One of the great historical advantages that the US had as an industrial power was economy of scale. This allows higher productivity. It is a big part of China's cost advantage today. A Mars colony will be a relatively small affair for a long time to come. Small nations can dominate individual industries if they have export markets. But it is progressively more difficult for a nation to manufacture all of the goods it consumes if it is small and lacks scale economies in internal markets. I've never denied that. Economies of scale allow you to corner markets on Earth. On Mars of course there is, essentially, only going to be one market and economies of scale are going to be of low importance (except in relation to exports). My point really is how much of a surplus in terms of resources will there be on Mars and if there is a surplus what can that surplus be used for. You can take this sector by sector...there will be a huge agricultural surplus, which can be used to create food stores for new arrivals, allowing the colony to expand rapidly as newcomers have a ready supply of food without themselves having to produce food. If the per capita agricultural productivity is extremely high - even higher than in the most productive places on Earth - then proportionally even more people can be freed up to work on other projects. If the community can satisfy all of its needs (food, habitation, life support, clothing, hygiene, etc) within say 50% of the combined labour time then you have all those extra hours that are available for other projects above and beyond the immediate needs. In a colony of 1000 that could translate to 1,872,000 hours to pursue other projects. Obviously a lot would be expended on research, science, and exploration. But there would still be huge labour resources available to apply to such things as constructing and producing rockets. We've seen what a ramshackle economy like North Korea can do in terms of producing advanced rockets. Given the low G on Mars, I see no reason why this hi-tech community couldn't within 10-20 years be producing their own rockets and interplanetary ships. They may consider it worth while doing this in order to facilitate trade and colonisation. 4. It is not at all true to say that material resources will be virtually free on Mars. Mining will require substantial investments in heavy equipment, energy and labour, just as it does on Earth. A sizable portion of this must be imported and this will be the case for a long time to come. What's more, Mars is an altogether more difficult environment to work in. It is colder, subject to large temperature swings and without air. Expecting materials to be cheaper than they are on Earth would appear to be optimistic. Against what you say: there are no rents or licence fees that have to be paid and no taxes. The Mars surface is effectively a ready-made road surface. There are no large marshes or river barriers to road transportation. Assuming we will be the first miners on Mars, then many deposits we require will be at the surface, making mining much easier. Whereas on Earth we require billions of tonnes of stuff and have to go ever deeper to find it, the Mars community will only need hundreds or thousands of tonnes. I dispute that the Mars community will have to import energy or equipment. I think they will be capable of producing the energy they need from ISRU PV panels and diggers, drills, picks and the like they can themselves make using 3D printers and small scale industrial machines. 5. The assumption that energy will be cheap because colonists can make solar panels is unsupportable in my opinion. There are some things we can turn to our advantage on Mars. But overall, solar power on a planet with 2/5ths the sunlight intensity is not going to be any cheaper than it is on Earth. In fact the energy return on investment for solar panels, will inevitability be weaker than on Earth. The equipment used to manufacture the panels must of course be imported at enormous cost. Problems relating to power storage will not be any easier. There will be machines exported to Mars initially to allow them to make solar panels. I would consider that part of the initial capital endowment. Once you have the basic industrial infrastructure in place, then the Mars community can themselves make the machines that make PV panels. There are a number of products that I would consider of high priority for Mars: automated PV Panel manufacturing machinery is one. Again power storage is not difficult in a small community. I think the Mars community would build up large stores of methane and oxygen (probably in a liquid state which should be easier to achieve on Mars than on Earth) to guard against low PV production levels during extended dust storms. A few thousand tonnes might be required for a 1000 strong colony but this will probably dovetail nicely with propellant production. For night storage, chemical battery facilities will probably be used. Of course a Mars settlement will be designed to minimise storage, so hot water for heating, cooking and hygiene will be produced during daylight hours - in the same way oxygen will be produced and water purified during those hours. All in all, it is important to remember that wanting something to be true will not make it so. When one is enthused with an idea or concept, it is all too easy to bend facts to support the conclusions we want to hear. I don't think I am indulging in wishful thinking - and let me add I was always an advocate of automated orbital assembly and refuelling, propulsive landing and solar energy for Mars...all three are to be found in Musk's plan. In other words, I think I already have a reasonable track record on these things. I think we're going to be surprised at how quickly we can develop Mars, especially as we are now talking about cargo loads of 150 tonnes. Solar panels have, what, an EROEI of 10 on Terra? That drops to 4 at Martian insolation, and an energy payback time of 5 years. If all the power is going on making new solar panels, then that means the power production can grow by the natural exponent every 5 years. In 20 years time, you'll have ~55 times as much power available than when you started. You wouldn't really be awash in cheap electricity... of course, if you're importing the panels then you don't have the payback time to worry about, but you're then paying for the cost of imports. You'd need to look at the per capita figures as well, not just the EROI . I am suggesting that from the get-go the Mars colonists will have produced way more energy per capita than we have on Earth. If you had 55 times the amount of energy you started with, the size of the energy surplus you would huge. I don't think after the first 5-10 years or so Mars will be importing panels. Once they have sorted out various other priorities (food production, construction materials, mining locations and so on), the stage will be set for producing panels. Initially this will be done using imported, largely automated machines. A couple of decades on, there is no reason why most of those machines won't also be made on Mars with perhaps some small elements e.g. diamond saws and specialist chemicals still being imported. You then run into the problem of low EROEI. Your doubling time is, charitably, going to be around 5 years. That's power that can't be used for anything else. Capital can't substitute for physical limits. If you only have 500 calories per day to eat and no-one is selling food, waving a million dollars around won't stop you from starving. I really can't make sense of that comment. You're not suggesting the early colonists won't be able to produce enough food to eat are you? You only need to double your energy production if your population doubles (as a rough calculation). If you had an energy surplus to begin with and you double your energy production, your surplus has also doubled and you can do even more things of your choosing. Let's remember we now have the context of Musk's proposal. He's talking about delivering at least 300 tonnes of cargo to Mars on Mission One. That's a lot of cargo. Maintaining that delivery pattern over 6 years (three deliveries) you would have 900 tonnes to play with. If you allocated 150 tonnes say to your energy and energy storage systems, you would have a huge amount of energy available - probably something like 1.5 Mwes average output. You can then begin work on fulfilling your industrial plan. What I'm saying is, there are physical limits to the rate at which you can increase your solar power base, and funnelling more money at the problem won't change that. Take, for example, sheep. A ewe takes 1 year to reach maturity, at which point she can be bred. If you started with a ewe and a ram, you can (theoretically) produce as many sheep as you want. But it will take time. There are hard limits to the rate at which you can increase the size of your flock, because of the time it takes to go from conception to a mature ewe. If you wish to sell some of the sheep in the meantime, the rate is reduced further, because you're getting rid of sheep you could use for breeding (in the analogy to solar power, using power for purposes other than producing more solar panels). Of course you *could* just buy a load of sheep all at once. But that's not the cheap option. On the other hand, the energy payback time might be as low as 15 months on Mars, which would make it more reasonable to expect large amounts of power, at least during the day. Storage is still going to be an issue, but if we don't do manufacturing during the night, the winter, or dust storms we should be able to manage. Still, energy will be far more expensive than it is on Terra, so Mars won't be competing on having cheap power. 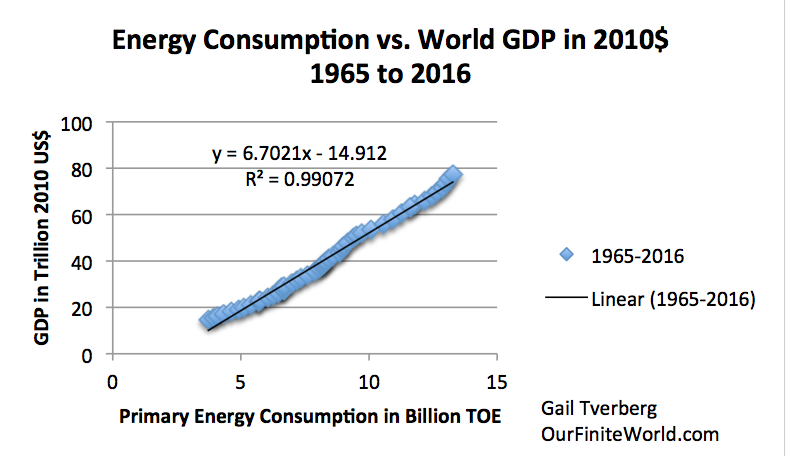 This one chart explains why it will be so difficult to build a prosperous society using solar power, even on Earth. Earth based civilisation has developed a huge surplus of wealth thanks to the almost free energy provided by fossil fuels. Whereas the steady income of renewable energy is like earnings, fossil fuels are like a windfall inheritance. The only cost associated with extracting them is the cost of going to the bank. In the centuries before human kind gained access to this energy, human numbers and wealth increased at a very gradual pace. Between 1000BC and 1500AD, numbers roughly doubled from 500m to 1bn. Then human beings began exploiting fossil fuels. Within 2 centuries of starting that process and reinvesting the wealth gained, human numbers increased about 6 times and total material wealth about 100 fold. Such is the power of high EROI energy. Understand that and you should also understand why it is not practical to build a society on Mars using low EROI energy. EROI is significant but not overwhelmingly so. Societies like Mesopotamia had access to oil but made little use of it. Societies that didn't have access to fossil fuel like Japan in the 1700s nevertheless created very complex economies with cities as large as one million people. Fossil fuels are of course less useful on Mars because (a) we can't just use the atmosphere to produce combustion and (b) fossil fuel management requires a significant labour input (and labour will be in very short supply on Mars). Solar energy provides a healthy return on energy input, but in terms of Mars, it is highly desirable because it will not require much labour input either. The fall in price of PV energy systems has been dramatic, precipitous since the 1980s and nearly all analysts agree it will continue to fall dramatically - indicating that less and less energy input is being required (which means in turn that EROI is improving). On Earth your EROI gain needs to be spread across the whole of society, which includes a large proportion of people who are economically inactive. That won't apply on Mars. So you can get the same production with a lower EROI. On Mars the weather is so benign that support structures for the PV panelling can be much lighter = less energy input. I have read your response to my initial post and I disagree with many of the points you made. However, I believe that Terraformer and Antius have done an admirable job in pointing out the problems with what you've said and in making counterpoints so I will not be duplicating their efforts with a complete post of my own. (a) Establish how many people work full time in the US - or better what is the population % as a full time equivalent. About a third of UK workers work part time. All people on Mars, unless they are ill, will be working full time (in fact probably more like 72 hours a week rather than 40 hours, which we may take to be a reasonable average in western countries like the UK). You probably get an immediate tripling of productivity purely in terms of work hours in the Mars community compared with the US. For the record, the average hours worked in the US is 34.4 hours per week, just a bit shy of full time. I would be skeptical of the notion that in a society with near-universal workforce participation that people could work (as you apparently believe) 12 hour days, 6 days a week. Just for starters, that sounds horribly unpleasant. Physical work (which resource extraction and manufacturing often are) is also quite tiring. People matter, after all, and even if you're willing to ignore their quality of life (which we shouldn't) 72 hour workweeks will create a problem with burnout and people wanting out. A situation where people want out and have nowhere to go is not one that is likely to go well. Consider also that there is a substantial amount of labor that people do outside the money economy that are still necessary. Things like taking care of one's health, cooking, etc. are not counted by statistical agencies but are still quite vital. In the days when men worked 70 or 80 hour work-weeks at a factory or in a mine, they would often be done by women. We have advanced as a society, though, and that's not the case anymore. I would be willing to adjust to a 45 hour work-week. 45 hours relative to 34.4 represents an increase of 31%--nowhere near enough to take a productivity multiplier of 7 (which, remember, is an extremely optimistic upper bound) and bring it into the 100-1000 range. I said this earlier, but I'll say it again: My estimate of the productivity multiplier is extremely optimistic. As we have all become aware of over the last so many years, the US is a particularly unequal country. this link, giving data from the World Bank on the income share going to the top 10%. The US is somewhat of an outlier in this sense as other countries are generally closer to 20 or 30% of total income going to the top 10%, although more in poorer countries. I said before that my estimate of 4.72x productivity is a huge overestimate, and it is. So if we're going to argue over 30% differences, I can just as easily come back with a lower and more reasonable productivity estimate. I thought you might take this tack, but it's quite wrong, and here's why: GDP is a great indicator for our purposes, because it's industry-neutral. It doesn't matter if someone is mining for Iron, building widgets, farming for turnips, cleaning houses, teaching children, or building apps that make a fart noise when you press a button. Their contribution to GDP is the same as long as their productivity is the same. So, for example, if everyone in the US stopped doing whatever they were doing and dedicated all of their time to nailing boards to each other, GDP would be constant. Our annual "nailed-together boards" output would go way up, but GDP would be the same. It's true that the employment proportion in the various economic sectors will likely be different on Mars than on Earth, but the effect on output will not be immediate. It's also true (and in fact vitally important to recognize) that industrial production is not the measure of an economy in the 21st century. That wasn't even true in the 20th century. I would also argue that the claim you're making here is already accounted for in the workforce participation adjustment. How long do you think people on the ISS work? We can perhaps argue about whether their compulsory exercise is work or not. I've often worked 72 hours a week...it's not that tricky. Remember, they basically won't have any commute. They are already in the workplace. They don't have to do any major grooming either...they've already got a time saving of probably 10 hours a week compared with your average worker on planet earth. "Industry neutral" is about the most absurd term you could use to apply to Mars. So you're saying that the early Mars colony should be expected to have a horse racing industry, a beauty parlour industry, a lawn mower industry...etc etc? It seems you are, in which case I can only ask you to consider how anyone can take that approach to Mars? The Mars colony will not be replicating the full range of economic activity we see on Earth and equally it will be undertaking stuff not seen on Earth. Isn't it time you got real about this if you want to have a serious discussion about the Mars economy? I really don't think you understand how economies work. You could take away 50% of the service economy in the USA and life would carry on. In no time at all you would find the removed services were replaced by other services. You couldn't take away 50% of the food production without producing a severe economic shock. Likewise you couldn't subtract 50% of energy production or steel production. Economies are built from the bottom up. A beauty parlour is not the equivalent of a field of wheat. A beauty parlour is something that depends upon the field of wheat: the field of wheat doesn't depend on the beauty parlour. If people spent most of their time nailing boards together the economy would collapse: agricultural production would fall, so would steel production so would all the other elements of a productive economy. You really don't understand the basics of an early Mars economy. There will be no problem with finding things for people to do. There will be no unemployment - it will be zero or very close to zero. Industrial production, not the service sector, will be the absolute priority of the early Mars colony. The idea that the first settlers on Mars are going to be setting our flower stalls, starting coffee shops and opening fashion outlets is just truly, truly absurd. It seems that your understanding of the term "industry neutral" is the opposite of what I actually meant by it. It's true that the employment proportion in the various economic sectors will likely be different on Mars than on Earth, but the effect on output will not be immediate. It's also true (and in fact vitally important to recognize) that industrial production is not the measure of an economy in the 21st century. That wasn't even true in the 20th century. The point is that GDP per capita is dependent on a lot of things, but the particular mix of industries in an economy is not one of them. Instead, it's about the abstract productivity of the sectors that you do have. Incidentally, the sectors you seem to think will be most prevalent--resource extraction and manufacturing--tend to be low-productivity sectors on Earth relative to others. Given a high rate of population growth and the relative ease of Earthsourcing certain service-sector jobs, we are in agreement that structure and infrastructure fields will be substantially more prevalent on Mars than they are in Western economies. The point is that these fields are unlikely to be substantially more productive than they are on Earth just because of an endowment of capital. The point is that these fields are unlikely to be substantially more productive than they are on Earth just because of an endowment of capital. In terms of productivity within a steel plant, about 1000 tonnes is produced by one person - but there can be 3.5 times that many people involved in the mining, transportation, and distribution side. So 4.5 people. I would be surprised if on Mars you couldn't get that down to 2 people. These wouldn't be full time...mining, steel production and distribution processes would just be part of their oversight responsibilities. So you might say have a team of 8 each devoting 0.25 of their hours , about 18 hours a week to supervising the steel production process. The per capita person question is one of through put to equipment capable to make the product and that is related to energy available to run the process. Correct. Globalisation has fooled many people into believing that economic production can somehow be decoupled from consumption of energy and other resources. At a local level, this appears to be true. But it has only worked in the western world because it was possible to outsource energy intensive industry to China. At a global level, GDP is a direct function of energy use. The economy is a thermodynamic machine. It takes energy and other resources, and converts those inputs into goods and services that human beings value and consume. The volume of goods and services produced is a direct function of the total energy available to support production. Artificial energy is also a way of leveraging human labour. We do this using machines that process matter using artificial energy into goods that we then consume. Capital is basically the stock of machines and supporting infrastructure that allow human beings to leverage their labour in the production of goods. But that 'capital' is only effective in leveraging human labour so long as there exists an energy source capable of powering it. A factory, a furnace, a loom, a machine of any kind, is simply a means of using energy to process matter into something that human's can consume. This is why in the final calculation, GDP is an almost linear function of exergy - of thermodynamic work. This is why the EROI (energy return on investment) of the energy sources of a society is important. Out of the energy produced by society, a certain amount must be reinvested just to maintain the energy supply. After that, some must be invested to maintain infrastructure. Some is then invested in the production of consumables and luxuries. Anything left over, supports growth. If EROI is poor, a much larger share of energy produced must be invested in maintaining the base energy supply. After maintaining infrastructure, less is available for manufacture of consumables and luxuries. And less is available to support new growth. And that smaller margin reinvested in new growth of the energy supply, will yield a smaller return, because EROI is lower. This is why, for so many centuries before the industrial revolution, human numbers and living standards did not increase. It was only after human kind developed ways of unlocking the high EROI, almost free energy of fossil fuels that modern culture and high living standards developed. We could never have done this using renewable energy, because there was never sufficient surplus energy to make the capital investments necessary, so long as we lived off the land. And there would have been too little surplus energy to power the machines, had we been able to construct them. A Mars colony needs a high EROI energy source. For a Mars colony to be successful, it must rapidly convert inert materials into new infrastructure - new factories, new mines, new food production and new energy sources to power it all. You cannot do that if a large part of the energy supply of your colony is consumed simply replacing itself. I don't think characterizing this as a "disagreement" is entirely accurate. Terraformer, Antius, and I have provided evidence, explanations, examples, and models in support of our points where you have generally provided opinions. See below, where I have bolded every time where you have used your opinion in lieu of evidence to advance your case. You did it five times in a relatively short post. In terms of productivity within a steel plant, about 1000 tonnes is produced by one person - but there can be 3.5 times that many people involved in the mining, transportation, and distribution side. So 4.5 people. I would be surprised if on Mars you couldn't get that down to 2 people. These wouldn't be full time...mining, steel production and distribution processes would just be part of their oversight responsibilities. So you might say have a team of 8 each devoting 0.25 of their hours, about 18 hours a week to supervising the steel production process. South Korea is the world's largest steel producer (1,330 kg/person-year) and Japan is second (825 kg/person-year). You're right to say that it doesn't matter, though--it's a difference without meaning. Steel production is not the measure of a modern economy. The products of the service sector are not value-less. In fact, the existence of a large service sector is the reason we are able to enjoy high standards of living in the developed world. The Mars colony you are describing sounds something like a Siberian work camp. Let's conduct a thought experiment: The US State of Alaska has abundant, cheap land, and in general does not levy a property tax outside of currently-existing towns. Though difficult to get to (roads are poor-to-nonexistent and the distances involved are large) it's much easier to get to Alaska than Mars. Likewise, though inhospitable (temperatures get very cold) it is much more hospitable than Mars. Is there any amount of capital investment that could make a community in rural Alaska a thousand times more productive than a town in the mainland? And if so, why have you (or someone else) not founded such a community? Is the reason perhaps that the economics you're employing are nonsense? Mars is a different planet, but the people will be Terran. The laws of physics are the same, and the planet poorly suited for human life. The technology available to Martians will be the same as the technology available one Earth. If the claims you are making are valid, we would be able to completely eliminate poverty in the world, and indeed, able to raise everyone's standard of living to a level enjoyed only by a privileged few. What is your explanation for why this has not happened? None of what you say is very controversial in and of itself - it's the conclusions you draw in relation to Mars that are heading in the wrong direction. If we assume an EROI of 4, that means 20% of energy generated over the lifetime of the system must go into replacing the energy system - we can assume that's 20% of energy use constant for the sake of simple calculations. So, if the Mars residents energy consumption/generation is 20 Kw per capita, with an EROI of 4 as suggested earlier, then that would mean you had to use 4 Kws to replace the energy system, leaving you 16 Kws...still way more energy per capita than available in the USA on a per capita basis. There is no doubt that on the Musk plan (he advocates solar energy, let's not forget) with a 300 tonne cargo delivery, there will be no problem with delivering an energy system that could produce 20 Kws average per capita for say a 10 person crew. Might be a lot more. They could be unpacking 50 tonnes-100 tonnes of energy equipment. Who knows at this stage? With a hundred tonnes of solar energy equipment you could be averaging 1500 Kws or a 150 Kws per person (assuming 10 persons) - over 16 times the US average. I would also add that there is not a one for one match between energy use and production. We know improved energy efficiency has been exerting quite serious downward pressure on energy usage. Per capita energy use in America is already around 10kW. You're expecting your 1st generation Martians to be 100-1000x as productive with only a doubling of energy availability? I have to ask, what do you do for a living, louis? This isn't meant as a personal attack, I'm just interested in knowing what the experiences and qualifications people here have. Then you get into the issue of comparative advantage. A good computer programmer can spend all their working time doing that, and consequently earning a high income, because a lot of people who aren't good computer programmers (or qualified for other high income occupations) are doing the lower paid work that's needed to keep the office and streets clean, the lights on, the food in the supermarket (all stages, from farming to store)... if our programmer had to do all this for themselves, their earning ability would be significantly diminished. To put it simply, if you had a country composed entirely of people qualified for "high productivity" jobs, they wouldn't be anywhere near as productive as they would be in today's America, because your doctors will have to sweep the streets and your programmers pick fruit in the fields. Well, unless you automate those, but there are limits to that. One could call the know-how for automating low-productivity work a kind of "informational capital", one that we as a society are heavily investing in right now. In reality, lower EROI does not lead to arithmetic reductions in disposable wealth. What I mean to say by that, is that reducing EROI from 100 to 4, would not lead to a 19% reduction in disposable income. It doesn't work that way. Because of the need for unavoidable energy investments in infrastructure and base living standards, an EROI beneath a certain critical value will eventually lead to societal collapse. It has happened plenty of times before in human civilisation - the primary energy source declines and the society can no longer afford to maintain the infrastructure that it previously built or minimum living requirements for the population that has grown up. On Earth, the result is usually civil wars, increasing political oppression and genocide. In fact, the economic problems that we have here on Earth, I.e. the ongoing Financial Crisis, has it's roots in the falling EROI of our energy sources. This is especially true of oil and gas. For coal, not so much. Basically, industrial civilisation grew and prospered on the back of almost free energy. The fact that we now need to resort to fracking and offshore drilling to obtain that energy (which is much more expensive and has lower EROI than giant onshore fields of old) is a clear sign that the era of cheap energy and with it high rates of economic growth, are over. Soaring levels of debt represent the widening gap between what we need and what we can afford. Worryingly, our own civilisation may be close to collapse. We do not know what the minimum practical EROI for Martian civilisation will be. A low EROI may manifest itself in poor rates of growth or the need for continuous subsidy from Earth. The fact that even air is not available for free on Mars, would seem to suggest that minimum EROI for a Martian city or colony, will be higher than equivalent settlements on Earth. It takes a lot more energy just to provide the basics like air, food and water on Mars. So in all respects, a civilisation on Mars will be far less tolerant of high energy costs. On Earth, we have been able to integrate small amounts of intermittent renewables into our electricity grids, without collapsing our economic systems (at least, so far). But this has only been possible because renewable energy is essentially subsidized with fossil fuels. Fossil fuels are used to reduce the iron and silicon that makes wind turbines and solar cells. And fossil fuel power plants provide backup for the renewable energy sources, which negates the need to store energy, but also limits the proportion of renewable energy in the mix. If we had to store electricity in batteries or some other means, there is no way intermittent electricity could ever be affordable. I think Musk understands some things better than others. What you are describing is a subsidy. The cost of the energy source supporting a 10 man crew, is affordable, because Musk is prepared to subsidize its cost and the cost of shipping it to Mars. That could work when things are essentially small in total scale. It starts to break down as the scale of the society increases beyond what any Earthbound entrepreneur or government can support. Trade balance then becomes more and more important. It is already a severe problem for a developing Mars colony, because of the high cost of transportation between Earth and Mars. Under that burden, it really is important for a Mars colony to become as self-sufficient as possible, as rapidly as possible and to maximise the productivity of local industry. The worst thing you could do is hamper it with a low EROI energy source for some silly ideological reason. Of course, Mars does not have fossil fuels that we know of, nor any air to burn them in if it does. I will post again the chart showing energy source EROI. Which ones offer both high EROI and are available for use on Mars? I will give you a hint. The list is extremely short. There is absolutely no evidence that an EROI of 4 will lead to societal collapse. I can't actually think of any societal collapses due to low EROI. Perhaps you can, but they must be quite rare. It will take decades, more like centuries, to build up Mars to anything comparable with human populations on Earth so the alleged crisis would take that time to eventuate. The EROI of PV energy systems has been steadily improving and will continue to improve as the technology advances. It is going to be way better than 4 on Mars in 50 years time. Probably more like 15. I think you're worrying over nothing and avoiding facing the reality that the early colony will have hugely greater energy resources per capita than the Earth average or even those of the USA. You can call the initial energy endowment a subsidy if you like, but that's neither here nor there. The Mars community will be able to produce their own energy systems in a few years and then it won't be a "subsidy" on any definition. In reality, lower EROI does not lead to arithmetic reductions in disposable wealth. What I mean to say by that, is that reducing EROI from 100 to 4, would not lead to a 19% reduction in disposable income. It doesn't work that way. Because of the need for unavoidable energy investments in infrastructure and base living standards, an EROI beneath a certain critical value will eventually lead to societal collapse. It has happened plenty of times before in human civilisation - the primary energy source declines and the society can no longer afford to maintain the infrastructure that it previously built or minimum living requirements for the population that has grown up. On Earth, the result is usually civil wars, increasing political oppression and genocide. In fact, the economic problems that we have here on Earth, I.e. the ongoing Financial Crisis, has it's roots in the falling EROI of our energy sources. This is especially true of oil and gas. For coal, not so much. Basically, industrial civilisation grew and prospered on the back of almost free energy. The fact that we now need to resort to fracking and offshore drilling to obtain that energy (which is much more expensive and has lower EROI than giant onshore fields of old) is a clear sign that the era of cheap energy and with it high rates of economic growth, are over. Soaring levels of debt represent the widening gap between what we need and what we can afford. We do not know what the minimum practical EROI for Martian civilisation will be. A low EROI may manifest itself in poor rates of growth or the need for continuous subsidy. The fact that even air is not available for free on Mars, would seem to suggest that minimum EROI for a Martian city or colony, will be higher than equivalent settlements on Earth. It takes a lot more energy just to provide the basics like air, food and water on Mars. So in all respects, a civilisation on Mars will be far less tolerant of high energy costs.